The building methods that were realized in the German Pavilion by Mies van der Rohe for the 1929 World's Fair have been groundbreaking for architecture throughout the world. After the exhibition, the pavilion was dismantled and rebuilt after several initiatives between 1983 and 1986 at its original place. Here you can book tickets for Bus Turístic, which will take you directly to the Mies van der Rohe Pavilion, and the Barcelona Card, which gives you a discount on the admission fee. 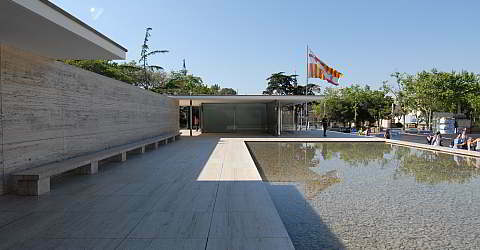 With the Barcelona Card you receive a 20% discount on the admission fee to Pavilion Mies van der Rohe. The Bus Turístic stops directly at Pavilion Mies van der Rohe. Download for a detailed overview. The exact times can be found on the notice board on the busses. The busses run every 5-25 minutes, depending on the season and occupancy. Green line from 01.04. until 01.11. Tourist information closed on 25.12. and 1.1. Then click on "Add to cart"
Fast shipping via post (4.90 € shipping costs): This allows you to hold your Barcelona Cards already before your trip to Barcelona. No waiting time to pick them up, no waiting at checkout. You are independent of the opening hours of the issuing offices. Shipping by e-mail (free shipping): Immediately after booking you will receive the voucher, with which you can pick up your booked Barcelona Cards directly at the airport or in several locations in the city area. With the voucher you will receive the Bus Turístic tickets and the Barcelona Cards at the issuing offices (Tourrist Info) in the airport and in the city. The vouchers for the Bus Turístic tickets can also be redeemed directly on one of the buses. The Bauhaus style is clearly recognizable in the pavilion. “Less is more” – Mies van der Rohe was one of the architects who planned their buildings according to this motto. With clear lines and simple forms as they are used in many skyscrapers and office buildings, the pavilion is a style template for modern architecture. With the constructive principle of the so-called “free facade” van der Rohe freed the building of the limitations of the supporting interior walls. The supporting function was transferred to the exterior walls or to supporting stilts. The spatial principle of the “open floor plan” considered the volume included in the building as one coherent space in which the individual functions are not divided into different rooms. The room units melt into each other, separating elements can be lights, different floor tilings, different colors, light room dividers or specific furniture. With the Barcelona Card you get a 20% discount on admission. The steel concrete roof is supported by filigree, unobtrusive chrome stilts. Between those, wall elements and windows reach from the ceiling to the floor. Marble of different colors is used for the walls and the floors, as well as travertine, a light and porous stone, and alabaster, recognizable by its linings. This is where the German Pavilion was a style template again: the stone plates were attached to the walls by a nature-stone fixation. This procedure is nowadays very popular with planners because it offers so many design options. The large window fronts have no clear separating function within the building, but they hint bordering elements, e.g. the light yard, where the bronze statue “Morgen” by Georg Kolbe is placed in a water basin. This type of fluent passage from interior to exterior areas can often be found in residential houses. The administration of Barcelona started the reconstruction of the pavilion at its original location in 1983. It was re-opened in 1986, the 100th birthday of Mies van der Rohe. Today, the maintenance of the pavilion is in the hands of the Mies van der Rohe Foundation. In the building, several exhibition objects demonstrate the work of van der Rohe. A documentary center is connected to the pavilion. The “Barcelona chair” is probably one of the most famous pieces of furniture exhibited in the pavilion. The chair designed by Mies van der Rohe is a milestone in the history of modern design and was used to seat the royal couple during the inauguration of the pavilion in 1929. The design is considered a classic and can still be found in many waiting rooms and lobbies of prestigious buildings. If the design of the furniture does not complete the structure of a building, there is no harmony in the interior. This concept almost forced Mies van der Rohe to design the matching furniture for his buildings. It is reported that Mies van der Rohe once said it was easier to design a skyscraper than a chair that has to be light but also stable and comfortable. All this has been accomplished with the “Barcelona chair”, which is why it has become a stylish icon. The frame consists of a welded steel strip, the leather upholstery is structured into squares by buttons. The chair is accompanied by a stool and a glass table. In 1953, the company Knoll acquired all rights to the chair. There are many imitation products, but the company Knoll still produces the chair with the original materials according to the original procedure. Priceless – well, almost: a chair costs about 3,200 Euros. Imitations are significantly cheaper, but usually inferior in quality. The original chairs by Knoll Studio have the company logo and signature of Mies van der Rohe engraved in the frame. A list of official vendors can be found on the web site of Knoll Studio. Mies van der Rohe counts as one of the most important architects of the modern era. He developed supporting structures that allowed for a high amount of flexibility in the design of the useful space. His buildings always underline the essential. The quote “More is less” is therefore often attributed to Mies van der Rohe. Mies van der Rohe was born on March 27, 1886 in Aachen, Germany, as son of the stone mason Michael Mies and his wife Amalie Rohe. In 1905, Mies started working as a furniture designer with the architect Bruno Paul. At the same time he attended the Berlin Academy for Fine Arts. He designed his first residential building for the married couple Riehl, who sought to promote new architects. His design was positively received by the critics. From 1908, Mies worked on large projects with Peter Behrens, where he also met Walter Gropius, who counts as one of the co-founders of modern architecture along with Mies. He founded his own office in 1913. During the next ten years, he designed several rather conventional residential buildings. Between 1915 and 1917, he created a neoclassicist building for the banker Franz Urbig, today known as the Churchill Villa because the British Prime Minister resided here in 1945 during the Potsdam Conference. In 1921, Mies van der Rohe joined the artists association “November Group”, whose architecture section he presided over. Here, he propagated the modern architectural style that gained him much attention. His design for a glass skyscraper at the train station Friedrichstraße in Berlin was rejected. His so-called “skin and bone” architecture was considered to be too avant-garde. On behalf of the German Communist Party, he designed the tombstones for the graves of Rosa Luxemburg and Karl Liebknecht in 1926. In 1929, he was assigned the artistic chief designer of the German Pavilion for the World Exhibition. The functionless pavilion became one of the main attractions of the exhibition because of its unconventional architecture and design. In 1930, Mies van der Rohe finished work on the Villa Tugendhat in the Czech town Brünn. This residential building is enlisted as a World Heritage Site of the UNESCO. In the same year, he was made Director of the Bauhaus by Walter Gropius. He held this position until 1932 when the Bauhaus was closed by the city council of Dessau. There are many factors indicating that Mies van der Rohe tried to make his arrangements with the NS regime, but his suggestions were rejected by the National Socialists. From then on, work as an architect became more and more difficult for him. In 1937, he was expelled from the Prussian Academy of Fine Arts of which he had been a member for six years. He emigrated to the USA in 1938, where he was highly appreciated as an architect. He became a US citizen in 1944. His last work was the construction of the New National Gallery in Berlin in 1968, the inauguration of which he did not live to witness. Mies van der Rohe died on August 17, 1969 in Chicago. The Bus Turístic stops a couple steps away from Pavilion Mies van der Rohe. With the Barcelona Card you get many discounts at sights in Barcelona. For example at the Pavilion Mies van der Rohe you get a 20% discount. We recommend to schedule about 30-45 minutes for the visit of the pavilion. The design of modern office building dates back to the developed style by Mies van der Rohe. You know it when you look at a new office building: basement to basement is built, but the building is supported only by columns. Walls are built much later and have no bearing function. The layout can be changed anytime. The by Mies van der Rohe designed Barcelona Chair can still be found in countless waiting rooms of companies, law firms and public buildings today. They aren't always originals that are still made today, but plagiarism. No design is as timeless as this chair. It is hard to believe that the design is almost 100 years old.